A combination of photos and clips from members of the church. To watch please click the link below. 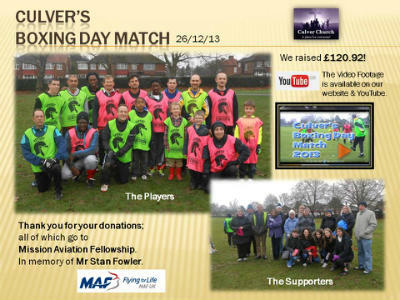 Boxing Day Match in memory of Mr Stan Fowler. To view the footage, please click the link below. Produced by Nicholas Carrington BSc, a graduate from Brunel University and Culver Church member. 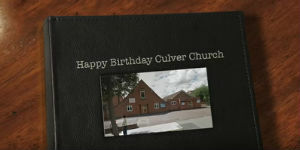 For my Final Year Project I chose to rebrand the visual identity of Culver Church. My aim was create a christian/hip hop styled Music Video that is urban, rhythmic and visually appeals to young people. The concept behind the soundtrack and the video, is about inspiring young people to understand that God does listen to us, and that he appreciates all our talents, skills and imperfections. I'd like to say a Special Thank you to all my vocalists, and performers from Culver Church, for their energy and contribution to the overall project.